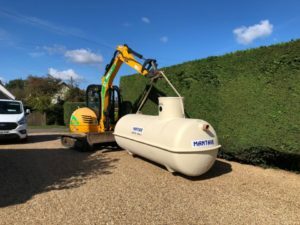 Mantair has been one of the UK’s leading septic tank installers for over two decades and provides a professional service from an initial site assessment all the way through to installation and commissioning of the chosen septic tank system. For rural locations where mains drainage is unavailable, septic tank installations offer an economical way to dispose of waste water in conjunction with the use of a drainage field (soakaway). Requirements surrounding septic tank installations. 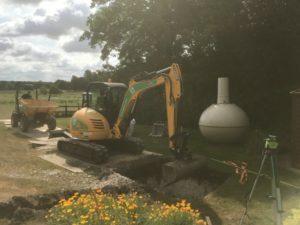 Although septic tank installations are a useful way of dealing with waste water, due to recent changes in legislation it is often necessary that a sewage treatment plant would need to be installed to ensure regulatory compliance. 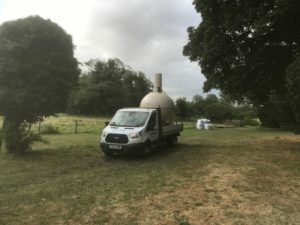 For instances where a septic tank installation is suitable it would also be necessary for a suitably sized drainage field to be installed to receive the effluent discharged from the septic tank. The first stage in determining the suitability of a septic tank installation is to conduct percolation tests to ascertain if the sub-strata is suitable for the installation of a drainage field. Percolation tests identify the porosity of the sub-strata and the size of drainage field required. In situations where the sub-strata is not suitable for a drainage field, a sewage treatment plant would need to be installed with the resulting ‘treated’ effluent being discharged to a watercourse. A septic tank receives all of the waste water from the house, including toilet, laundry, bathroom and kitchen waste. 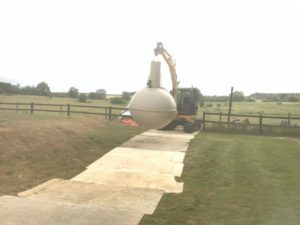 The main purpose of a septic tank is to separate the solid material and allow the sludge formed to undergo a process known as anaerobic digestion. This has the effect of reducing the sludge volume and therefore the frequency of septic tank emptying by vacuum tanker. The effluent from a septic tank is disposed of to a drainage field. Under no circumstances should it be allowed to discharge to a ditch, stream or any other watercourse. The components of a septic tank system are the septic tank, which in traditionally built systems can be one or two chambers, and the underground drainage field. Anaerobic digestion takes place within the septic tank whereby anaerobic micro-organisms develop and partially degrade the receiving waste water. Within the septic tank solids settle to the floor of the tank and materials such as tissue float to the top of the liquids and form a scum layer. Septic tank systems should have as a minimum an operating capacity of 2700 litres for up to 4 persons in full time residence. The size should be increased by 150 litres for each additional user. The operating capacity of a septic tank is the volume below the outlet from the tank. If a septic tank does not have enough operating capacity this will result in finer solids passing through the tank and blinding off the drainage field. In many traditionally built septic tanks, which are constructed from brick or concrete, the operating capacity is less than 2000 litres and as a result these tanks do not operate effectively. 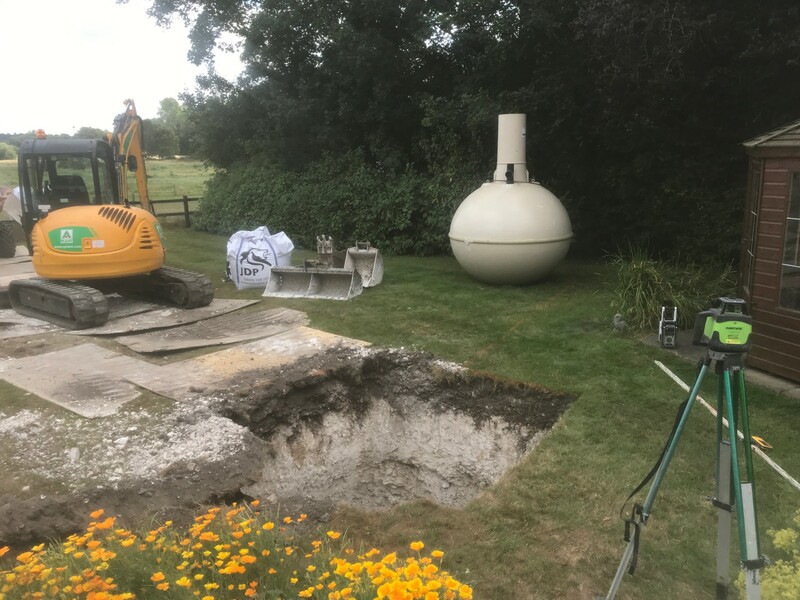 Older septic tanks are often smaller in size due to the daily flow being discharged to these tanks at the time of their construction being far less than modern day usage. 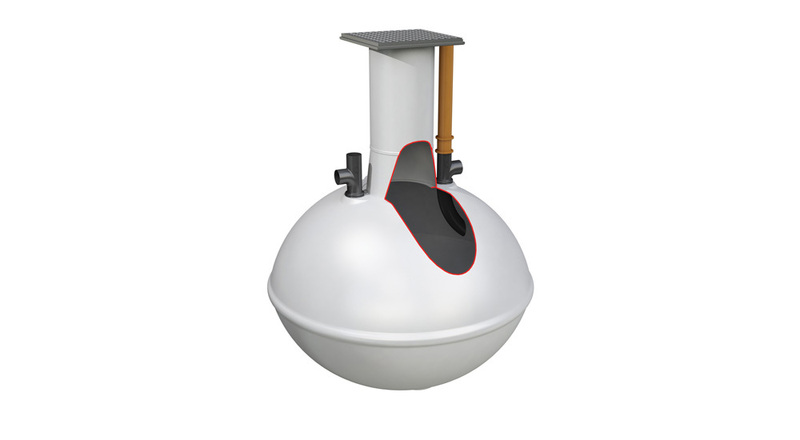 Factory made septic tanks are available in glass reinforced plastic (GRP) or polyethylene and should meet the requirements of BS EN 12566-1. 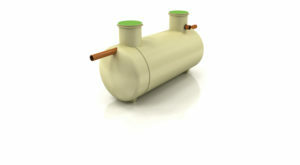 These factory made septic tanks are normally a single tank system and are available as a cylindrical or spherical tank. Within these tanks there are baffles which are designed to assist in the settlement and separation of solids and floating materials. 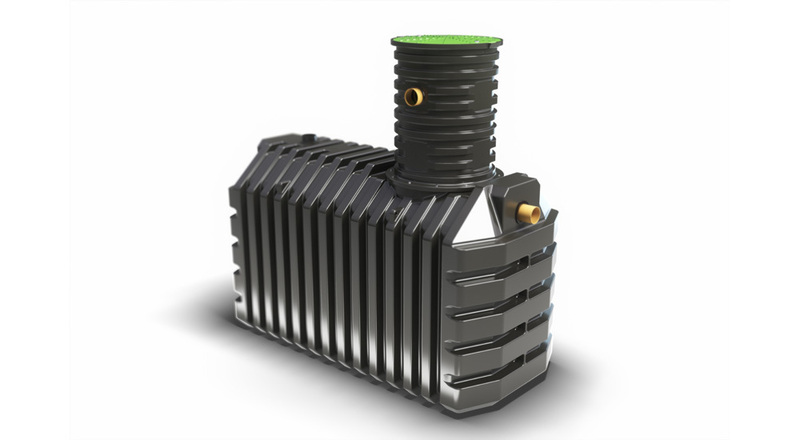 Traditionally built septic tank systems are usually one or two chamber systems. Two chambers systems can be either two separate tanks or a single tank with an internal partition wall. The floor of the tank is usually constructed of concrete and the walls are suitably rendered brickwork, concrete or prefabricated blocks. The tank should clearly be watertight and have the strength to withstand the weight of liquid contained and any external pressure. 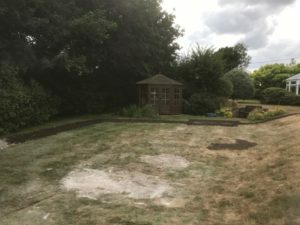 The owners of this property in East Anglia contacted us regarding their requirement to employ the services of a septic tank installer and after an initial telephone consultation a site inspection was arranged. The results of the site inspection showed that the existing septic tank and drainage field had failed and were in need of replacement. Percolation tests were conducted following the initial site inspection to determine if the ground conditions were suitable and the size of drainage field required. 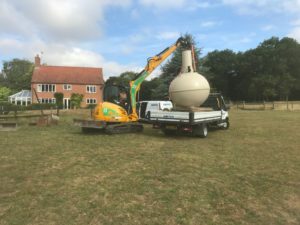 This septic tank installation in East Anglia was carried out and completed over a period of only three days, ensuring no holiday bookings were affected. 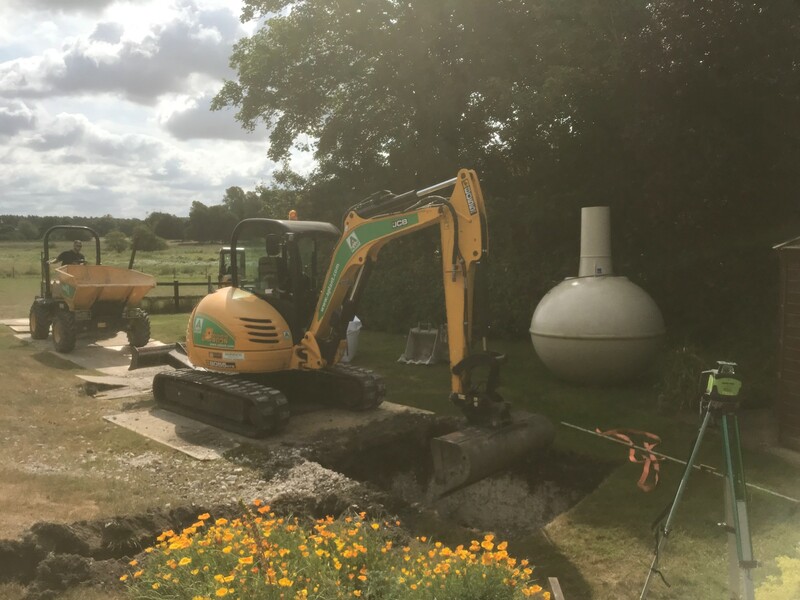 Prior to any works commencing Mantair engineers scanned the proposed location for the new septic tank to ensure that no underground services were present. The septic tank was delivered to the property using one of our delivery vehicles after it had been inspected at our head office in Essex. All septic tanks and sewage treatment plants we install are inspected prior to approval for delivery. On completion of the ancillary works Mantair engineers commissioned the septic tank and removed all machinery from site, leaving the garden in a neat and tidy manner. If you have a requirement for a septic tank installation or need advice regarding a septic tank problem, call our team today to receive a free site visit on 01255 853890.